The theme of the 2019 Annual Evaluation Conference is: Evaluation: A Diverse Field. Evaluation is a truly diverse discipline with a broad field of practice. 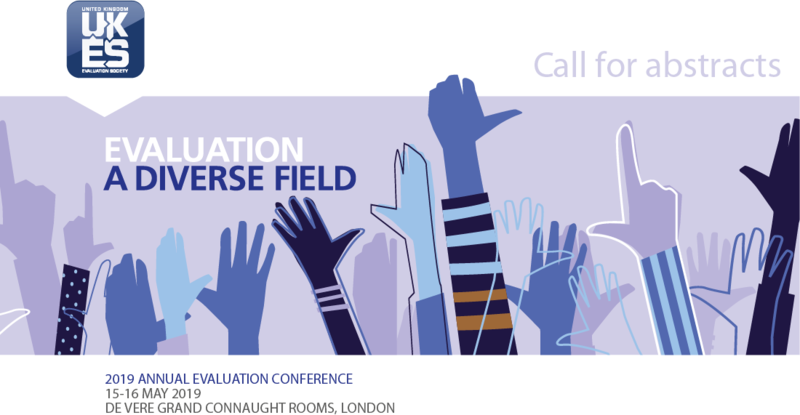 For our 2019 Conference, the UK Evaluation Society will celebrate this diversity – of types of evaluation, in different fields, using a range of methods. Evaluations are undertaken for different reasons, for different types of organisation, and by a range of individuals and organisations. Those working in evaluation come to it from a range of experiences, professional backgrounds and academic disciplines. And they practice it across a very wide range of fields and sectors, commissioning or using many contrasting and complementary approaches and methods drawn from quantitative and qualitative sciences. Yet, evaluators share a number of common attributes: in particular that their work entails evaluative practice, and they are proponents of evaluative thinking. We would like to celebrate the very extensive array of evaluative practice being pursued by members and delegates. We have had an excellent response to the Call for Abstracts and are very pleased that our draft conference programme (to be published shortly) does indeed reflect a broad spectrum of current evaluation. We have sessions from organisations in the public sector including: NHS England, What Works Centres, Department for Transport, Ministry for Housing, Communities and Local Government, and the Scottish Government. We have significant presentations from academic evaluators and those using evaluation in their doctoral studies, as well as a wide range of individual evaluation consultants and evaluation consultancies. A rich set of sessions under the theme of Evaluation designs, approaches and methods – a spectrum of innovative practice, including: Qualitative Impact Protocol (QuIP); Outcome Harvesting; Contribution Analysis; data visualisation; realist evaluation; and evaluation feasibility studies. A range of session formats, including: World Cafés, facilitated interactive sessions, panel discussions, keynote speeches, and sessions covering four related methods. Abstracts for poster presentations which fall broadly under the main themes of the conference can be submitted until 26 April 2019. Abstracts can cover a project, programme, case study or methodology; an explanation of what evaluation means within your organisation; or how you encourage application of lessons learnt and communicate findings. Posters will be displayed in a dedicated space at the conference venue and a prize will be awarded for the best poster.